Davis, Miggy, and Trout are up this AL MVP this year. I think it comes down to Miggy and Davis. Trout did post extremely impressive numbers with .323, 27 HR, 97 RBI, 33 SB, 109 R, 110 BB, and a .432 OBP. He’s also a great fielder, but his team was pathetic this year. As much as I would love to see Davis walk away with the MVP, Cabrera was easily the best player in baseball this year to me. His .348, 44 HR, 137 RBI, 103 R, .442 OBP, .636 SLG are pretty tough to beat. Davis Posted .286 53 HR, 138 RBI, 103 R, and .634 SLG. He led the league in HRs and RBIs but also struck out 199 times, 105 more times than Miggy. Baseball analysts have been placing a huge emphasis on WAR recently, and according to the scoring system, the top 5 are Trout(9.2), Josh Donaldson(8.0), Robby Cano(7.6), Miggy(7.2), and Machado/Pedrioa(6.5). Davis is getting shafted here because the AL 1st basemen are amazing, and also because he pretty much played first base every game this year. Kind of shocked by Donaldson, even though he was very good this year. I guess 3rd base was down this year. My guess would be 1.) Miggy, 2.) Davis 3.) Trout. I think Miggy is the definite 1 here with Trout and Davis being seperated by a few points for 2 and 3. I would probably chose Trout to build my team around, mostly because he is a young and tough 5 tool playerplayer, but if I was to build my team around a player for one season, gotta go with Miggy. Hopefully I am wrong and Davis wins this. Would be a nice boost going into next season. 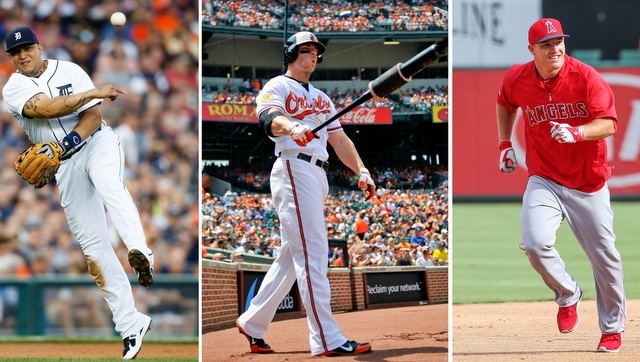 This entry was tagged AL MVP, Chris Davis, Dustin Pedroia, Josh Donaldson, Manny Machado, Miguel Cabrera, Mike Trout. Bookmark the permalink.